IRVINE, Calif. – Jan. 31, 2019 – Ephesoft, Inc., an industry leader in enterprise content capture and data discovery solutions, today announced the launch of its Ephesoft Cloud HyperExtender, the industry’s first hybrid solution that easily transitions the most resource-intensive processes into the cloud for peak performance, scalability and minimized upfront investment. This first-to-market hybrid offering enables organizations to optimize their existing Ephesoft Transact on-premise solution with improved performance, processing up to 2,500 pages per minute – more than 10 times faster than a strictly on-premise version. The Cloud HyperExtender is an add-on application that leverages high-performance cloud image processing in conjunction with Ephesoft’s latest release of Transact 2019.1, which uses a specialized type of artificial intelligence called supervised machine learning to optimize operational efficiency in document-intensive processes. After documents are captured in the on-premise system, the processing intensive Optical Character Recognition (OCR) task is directed into the cloud for fast processing, and then directed back into the on-premise system for classification, extraction, validation and export. The Cloud HyperExtender is ideal for companies and organizations with demand peaks in their business operations, which stress the infrastructure for document intelligence caused by either unpredictable or predictable seasonal volumes. Examples include retailers’ invoices and credit card applications during Cyber Monday and other shopping holidays; tax firms’ form processing during tax season; mortgage lender applications or loans during prime real estate seasons; and insurance company claims after a natural disaster. Enterprise organizations, from large banks or mortgage lenders to insurance companies with a steady flow of documents can benefit from Ephesoft Cloud HyperExtender to improve Service Level Agreement (SLA) times and expedite customer service responses. Customers that have volatile workloads will see significant cost reductions using the Cloud HyperExtender and will only have to pay for what they use, in addition to avoiding the needed operational complexity associated with managing data center infrastructure. This means customers can use less power to process more documents at a lower cost. Ephesoft worked with multiple beta testers that reported excellent results using the Cloud HyperExtender, including a large customer that processes a high volume of mortgages and loans. The Cloud HyperExtender will see the best performance with a Transact server deployed on cloud, including Amazon Web Services (AWS) and Microsoft Azure, but it can also be used from an on-premise Transact server with a high-bandwidth Internet connection. 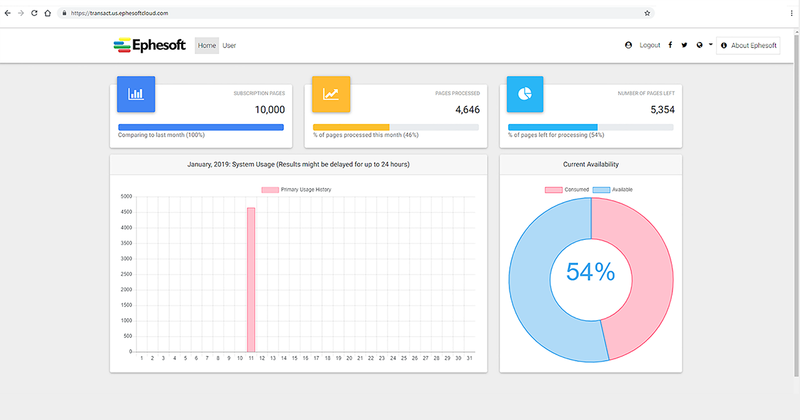 Ephesoft has taken the proper security measures to ensure data security, including encrypting data at rest and in transit, providing a secure API key, purging data on a daily basis and completing a Service Organization Control 2 (SOC2) compliance audit. This is the first of many cloud microservices and applications that Ephesoft will develop to help its customers. Ephesoft Transact with Cloud HyperExtender is available to customers, partners and resellers beginning Jan. 31, 2019 in North America, and expanding globally later this year. For more information, visit ephesoft.com/transact/cloud-hyperextender.